Manimahesh Kailash is regarded in many sects of Hinduism as the ultimate destination of souls and the spiritual centre of the world. In Hinduism, it is believed that Mountain Manimahesh Kailash is the house and adobe of Lord Shiva, the destroyer of evil and sorrow. He sits in the state of meditation along with his family. Manimahesh Kailash is lies between the 32° 24′ 6″ N, 76° 40′ 9″ E with the altitude of 5653 meters / 18447 feet from main sea level. According to one popular Local legend, it is believed that Lord Shiva establish Manimahesh as home when he married to Goddess Parvati, There are many legends narrated linking Lord Shiva and his show of displeasure through acts of avalanches and blizzards that occur in the region. The credit of discovering about this place goes to Saint Charpatnath. He was the one who discovered this place and told the common masses about it. Since then, every year a two-week long pilgrim is organised which start on the day of Krishna Janam Ashtami and ends on Radha Ashtami. A lake situated at the base of Manimahesh Kailash is known as Manimahesh Lake or locally Manimahesh Dal. Manimahesh Lake lies at the altitude of 13390 feet and 27 km from Bharmour. A Snow covered rock at the top of peak looks like real Shivling and the top of peak is always covered with clouded fog and doesn’t want to leave this peak. It’s a very rear chance when fog leaves the top of peak even if sky is clear. The glimpse of this sacred peak is life changing moment for Lord Shiva’s devotees. Manimahesh Lake is shallow circular lake gives it an enchanting appearance. A roofless temple, conspicuous with many iron trinkets, is seen on the opposite side. For beginner trekkers Manimahesh trek is the best route for beginning as the gradient is good and also provide pilgrimage visit to Manimahesh Lake. The name Manimahesh signifies a jewel (Mani) on Lord Shiva's (Mahesh's) crown and the moon-rays reflected from the jewel can be seen from Manimahesh Lake on clear full-moon nights (which is a rare occasion). 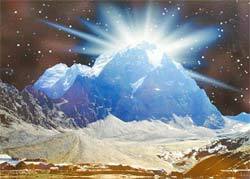 It is more likely to be the light reflected from the glacier that adorns the peak, like a serpent on Shiva's neck. Local legends and Lord Shiva’s devotees also clearing about the Mani Darshan or Divya jayoti. Early in the morning when a spiritual light flashes from the Kailash peak where Shivlinga is situated considered as Mani Darshan. For this moment and to glimpse this spiritual light devotees spend their night at Manimahesh Lake. And the glorious views of Manimahesh Kailash in the morning and at the time of sun rising touches the hearts of visitors. We can assist you for Manimahesh Darshan and registration in Yatra time. Contact us for the same. 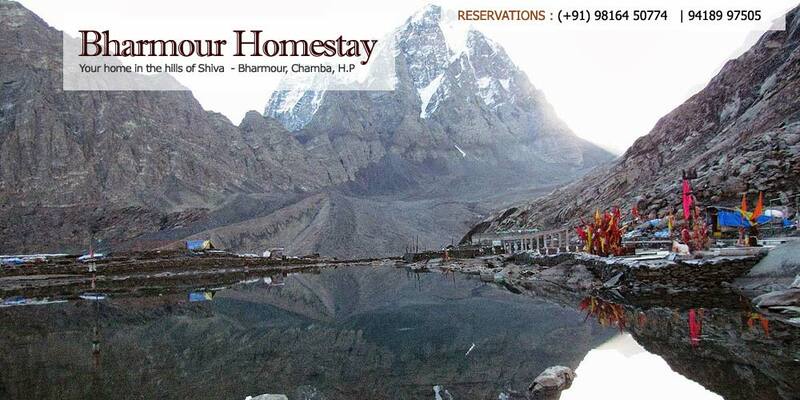 Assitance to visit the holy Manimahesh lake..
Bharmour is the home to lord Shiva. Every year thousands of visitors visit the scared lake of Manimahesh and also during the Manimahesh yatra. We can assist to to trek the holy lake with our professional guides and potters. Read more about Manimahesh lake..